For the next three days 23 contributors have come together make an incredible offer. 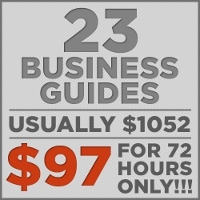 23 guides on self-employment freedom will be sold for $97, a price that would originally be $1,052 if you bought each of these guides individually. That’s the regular price total of what these guides sell for daily. I’ve had a chance to contribute to this sale with my own ebook, Reclaim Your Dreams (+ the action worksheets), and I can tell this is something you don’t want to miss. So, why am I joining in on this? Because I think it’s a great opportunity for me to get Reclaim Your Dreams into the hands of more people (obviously not every sale will be coming through me). I am a fan of Karol Gajda and Adam Baker, and I think what they’re doing with this is incredibly smart. Johnny B. Truant’s Zero to Business. If you’ve ever been incredibly confused about the tool’s you need to create a business online, this guide will clear that up for you. Includes step-by-step video instructions on setting up WordPress, Aweber, E-Junkie and much more. Reclaim Your Dreams from Yours Truly. A guide to reigniting your spark and following your dreams. Includes the “I’m serious about action” worksheets. Regular price: $47. Everett Bogue’s Minimalist Business Guide. Create your own business, minimalist style (Everett typically works only 10 hours a week and works from anywhere). Includes the 30 Day Quickstart Guide. Regular price: $47. Corbett Barr’s Affiliate Marketing For Beginner’s. Learn how to start your business quickly by marketing other people’s guides, without creating your own products. 5 core modules, 21 affiliate lessons, + 2 profitable case studies. Regular price: $77. Nathan Hangen’s Beyond Blogging. My friend Nathan’s guide is all about building a blogging platform that supports your ideal lifestyle business. It includes a 200 page PDF, 15 blogger case studies, and a 100k blueprint summary. Regular price: $47. Tammy Strobel’s Smalltopia; A Practical Guide to Working For Yourself. Tips, tools and strategies to help you create personal freedom through a very small business. Regular price: $27. Erica Douglass’s Guest Post Secrets. Includes access to the Guest Post Secret membership site, training videos, and email scripts. Regular price: $77. Jade Craven’s How to Network Fast. Building relationships has been a huge key to my own success and I don’t know anyone better to teach how to do this than my friend Jade. She has been a rising star simply through building relationships with successful bloggers. Includes mini-guides on guest posting, Twitter, blog commenting, and being a successful affiliate. Regular price: $44. Colin Wright’s Networkingly Awesome. If you’ve ever freaked out at the prospect of meeting people to grow your business, this guide will help you stop doing that, and start becoming effective at building relationships. Regular price: $20. Henri Junttila’s Affiliate Marketing Traffic Booster. If you want to start building an income writing articles, this guide can help you do it quickly. Includes a 110 page PDF, 6 how-to videos, and worksheets. Regular price: $47. You could buy any one of these products individually from the links above. Or you could get all of them for $97. It’s your call. $5 $10 (I’m matching it with another 5 of my own) of every sale will be donated to Charity Water. We’re aiming to raise enough money to build two wells. Click here for the 72 hour discount (takes you to 72only page). 5 Comments on "3 Day Freedom Guide Sale"
E. E. Cummings said – “To be nobody but yourself in a world which is doing its best, night and day, to make you just like everybody else means to fight the hardest battle which any human being can fight; and never stop fighting”. 21 tools to help us fight the crowd! $97 is a small price to pay for your freedom! Hi Jonathan! I found out about the package from you and bought the package yesterday. Awesome stuff. I am reading Colin’s Networking Awesomely and can’t wait to read your guide to Reclaiming Your Dreams! Thanks for sharing! Gibizz News » The Super Dooper Sale: Why I said HECK YEAH! What a deal. I can’t wait to learn about all those actionable things I can do to start making money right now on my own terms. Fantastic.